Thompson Bus Services is a small family company operating out of Joyner, on the north side of Brisbane. Thompson's currently facilitate 31 School Runs, 10 Urban Services and Charter Services. All our bus and coach drivers are professionals. Vehicles are air conditioned, with some seat-belted. We have approximately 45 vehicles with bus and coach sizes varying from 53 seats to 81 seat double-deckers. Various trailers are also available. We have the ability to transfer school camps, swimming shuttles, excursions, sport transfers, band tours or whatever your needs may be. While Thompson's specialise in School Charters, we also are experienced with Senior Citizen groups, school holiday groups, weddings, church groups and the list goes on. We have over 30 years experience meeting Charter needs. Today, Thompson Bus Service operates 40 buses and coaches, five Double Decker buses, six urban services, 33 school runs, a successful charter business, and they now employ 55 people. Jean Thompson said her husband Geoff’s one aim in life was to have his own bus company. “A driver and bus company manager himself, Geoff was always on the lookout for buses and bus services, in 1979 Lawnton Bus Service on Samsonvale Road in Joyner came up for sale, which we purchased in September 1979,” Jean said. Over the years Jean drove urban services and school runs with a baby in a baby seat, directly behind her. Urban services commenced in 1981, in 1990 Pine Rivers Coaches was purchased, and in 1999 Thompson Bus Services moved to their current Depot on Youngs Crossing Road, Joyner. During this time, Geoff and Jean had five children, Shane, Anita, Nellie, Rodney and Allana. Eldest child Shane has gone from the baby seat on the bus to the Executive Managers Chair. Anita and Nellie have worked in varying capacities within the business at different times, Rodney is Operations Manager and Allana is Accounts Manager. Allana, now with her own children, has also been known to do a “last minute” charter with a baby in a baby seat. The son of one Thompson’s original drivers and mechanics Harold Streek, Les, is Workshop Manager. Les used to catch his father’s school run home, went onto to work for Thompson’s in 1988 and is now wondering which his four children will be the next generation Workshop Manager. “Sadly, Geoff passed away in May 2005 and is still greatly missed,” Jean said. “Thompson’s are working with TransLink on the replacement of their five Double Decker buses over the next two years as children love Double Deckers, and that excitement has not faded in over 30 years. “Thompson’s are now taking the children of students they took to school in the 1980s and 1990s, with one of our current drivers, Michael Buckley, a past student who caught the bus to school remembering with excitement going on school camps in the Double Deckers. “Thompson Bus Services is committed to school runs and school charter and this is the heart of the business. “I have gone from writing charter details on a Corn Flakes box to the modern world of computers, somewhat reluctantly, and I still answer the phones and run the office on a day to day basis. 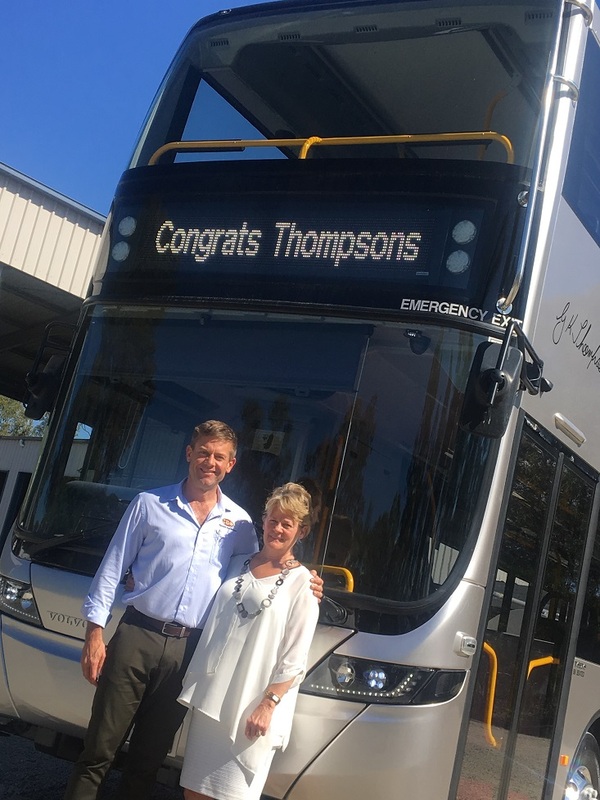 “The Thompson family love the bus business and the excitement of a new bus is still the same, it is still a race for each of the Thompsons to get to the new bus as it arrives in the yard. “From the commencement of our TransLink contract five years ago, Thompson Bus Service, through TransLink, have been in the fortunate position of being able to provide 23 new buses for our school runs and urban services and urban services now operate seven days a week. TransLink CEO Peter Strachan said he is proud to have such an iconic family business under the TransLink umbrella. “TransLink congratulates its service delivery partner Thompson Bus Service on racking up an impressive 30 years in the public transport business, and looks forward to growing with them over the next 30 years,” Mr Strachan said. Jean said that Thompson’s are very thankful to all their ex and current, wonderful and loyal drivers. “Some drivers that are still with us include Geoff Oldfield who started in 1982, John Hockey in 1987, and several other drivers who will reach their 20 year mark next year. “Bus drivers are a special breed and the responsibility of taking children to school is taken very seriously as safety was always our number one priority and will continue to be. The bottom line is, we love driving your children to school,” Jean said. Looking forward, the Thompson family will continue with the same resolve that Geoff had in operating a bus company for school students and the community and operating with every care and all the knowledge and skill that operating a bus company for 30 years gives you.